Welsbach Electric is one of the largest commercial electrical contractors in New York City. We specialize in outdoor electrical construction and maintenance, including complete design build construction, for government agencies, utilities, and private enterprises. 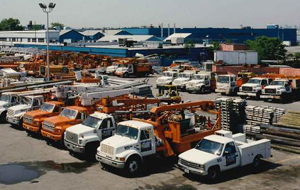 Our headquarters are located in Queens, NY, where we maintain an extensive, in-house inventory of materials, tools, testing devices, and consumables so we can provide prompt electrical maintenance services. As a commercial electrical contractor, our onsite garage services over 300 aerial and material handling vehicles as well as heavy equipment for trenching, cable pulling, and splicing. Our field force consists of highly qualified, IBEW (International Brotherhood of Electrical Workers) journeymen electricians and linemen. These employees are supported by experienced project management, engineering, accounting, and administrative personnel, who together make us one of the leading NY electrical engineering companies. To ensure timely and cost-effective service delivery, all work processes are guided by an ISO 9001:2000-certified quality management system and an established safety program. Visit our service pages to learn more about each of our electrical construction and maintenance service offerings.